What is A Debt Collection Judgment? You were sued by a debt collector and now a judgment has been entered against you. We hear the term “judgment” often and it may seem basic, but what does it mean to have judgment against you in New York? Understanding the answer to this question will help you to understand what to expect and what you can do to protect your rights as a consumer and a debtor. Initially, if a judgment is entered against you and the attorney for the debt collector files that judgment properly, it will be a lien on any real property you own in the county where the judgment was entered. If you don’t own property in that county but do in another, county within the state, the debt collector can file that judgment in that county resulting in a lien on your real property. If you own property in another state, the judgment can be “domesticated” to that state following that state’s procedure. The procedural generally requires the filing of a certified copy of the judgment along with an affidavit from the judgment creditor. If you have a bank account, the debt collector can freeze that account without any notice to you. However, there are some exemptions that apply including funds in your account if the balance is less than $1,740.00. If you have a job and earn a wage the debt collector can garnish up to 10% of those wages. If the debt collector doesn’t know where you bank, where you have property or where you work it will try to find out. The law gives judgment creditors a tool chest of devises to collect information about you. You, your friends, your family or anyone who might have information about your ability to pay a judgment can be subpoenaed to give information. This usually comes in the form of an “information subpoena” in which the recipient has to give sworn written answers within a short period of time. Also, the debt collector can and likely will run your credit reports to try to locate information about where you work, what property you own and where you have bank accounts. If you are broke, out of work, on social security, disability or unemployment and you have no non-exempt assets then you are what is called “judgment proof”. That means that there simply is nothing the debt collector can take from you – you can’t get blood from a stone. If you are judgment proof, tell the debt collector. They may ask you to prove it by signing an affidavit. Be careful when doing this and be on the lookout for dirty debt collector secrets. If you have income or assets you may be able to negotiate a settlement of the judgment. However, be careful when settling and make sure the terms are reasonable and feasible. If the judgment was won by default or if you have reason to fight the merits of the judgment, you may consider trying to vacate the judgment. Whatever course you take, you are always bettered protected when you are represented by a skilled and experienced attorney. Consider speaking with a debt defense attorney to better understand your options and the cost of defense. 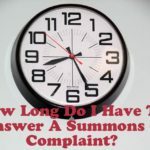 How Long Do I Have To Answer A Summons & Complaint? Sued By LVNV Funding, LLC In New York or New Jersey? Sued By Asset Acceptance, LLC In New York or New Jersey?